The Grosvenor in Cardiff hosted our second Welsh regional final of the weekend following Gary Musgrove‘s win the day before. Another five Welsh players would have their national final seat booked by the end of the day. Clint Seabourne from the Mount Pleasant in Cwmbran hit the rail first only to trigger further eliminations including the likes of Carl Watson and Darrell Maynard. Last season’s champ, Bernard Wright, made a good fist of his defence as he ploughed his way into the top 15 but ultimately fell just short of another final table in 14th place. The Team Event could have gone to many venues with the Courthouse in Caerphilly having two finalists. But top 30 finishers from the Parc Y Prior trio brought the trophy to Newport for the first time. 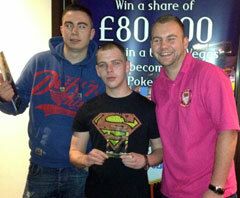 Congratulations to Ashley Davies, Kirk Powell and finalist Jamie Soper. The Wales Two final table saw the comeback of the weekend and a chip leader in Ben Davis who managed to finish in 9th place. With five national final seats we had five disappointed finalists and once Stephen Redman had bubble the national seats the tournament was soon to end. 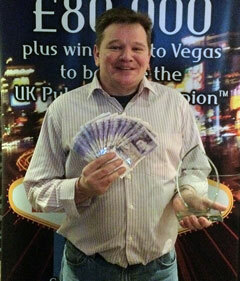 Our heads-up encounter saw short stack Chris Ware go up against Alex King in what would create another Welsh champion. The final hand was nothing more than a car crash as two monster hands were dealt in the form of Chris’s A-Q and Alex’s 10-10. A J-K-5 flop gave Chris even more outs and left Alex with a sweat on the turn and river. A 3 turn severely reduced Chris’s chances until an A showed up on the river to make Chris Ware our first ever Wales Two champion!